"[For this work] we have to thank the instigation of the former Russian ambassador to the electoral court of Saxony, Count Kaiserling, who often stopped in Leipzig and brought there with him the aforementioned Goldberg, in order to have him given musical instruction by Bach. The Count was often ill and had sleepless nights. At such times, Goldberg, who lived in his house, had to spend the night in an antechamber, so as to play for him during his insomnia. ... Once the Count mentioned in Bach's presence that he would like to have some clavier pieces for Goldberg, which should be of such a smooth and somewhat lively character that he might be a little cheered up by them in his sleepless nights. Bach thought himself best able to fulfill this wish by means of Variations, the writing of which he had until then considered an ungrateful task on account of the repeatedly similar harmonic foundation. But since at this time all his works were already models of art, such also these variations became under his hand. Yet he produced only a single work of this kind. Thereafter the Count always called them his variations. He never tired of them, and for a long time sleepless nights meant: 'Dear Goldberg, do play me one of my variations.' Bach was perhaps never so rewarded for one of his works as for this. The Count presented him with a golden goblet filled with 100 louis-d'or. Nevertheless, even had the gift been a thousand times larger, their artistic value would not yet have been paid for." Nineteen copies of the first edition survive today. Of these, the most valuable is the "Handexemplar", discovered in 1974 in Strasbourg by the French musicologist Olivier Alain and now kept in the Bibliothèque nationale de France, Paris. This copy includes printing corrections made by the composer, and additional music in the form of fourteen canons on the Goldberg ground (see below). The nineteen printed copies provide virtually the only information available to modern editors trying to reconstruct Bach's intent, as the autograph (hand-written) score has not survived. A handwritten copy of just the aria is found in the 1725 Notebook for Anna Magdalena Bach. Christoph Wolff suggests on the basis of handwriting evidence that Anna Magdalena copied the aria from the autograph score around 1740; it appears on two pages previously left blank. On the title page (see above), Bach specified that the work was intended for harpsichord. It is widely performed on this instrument today, though there are also a great number of performances on the piano (see Discography below). The piano was rare in Bach's day and there is no indication that Bach would either have approved or disapproved of performing the variations on this instrument. 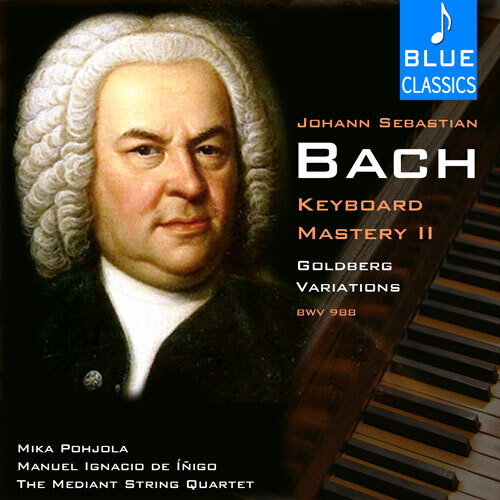 Bach's specification is, more precisely, a two-manual harpsichord (see musical keyboard), and he indicated in the score which variations ought to be played using one hand on each manual: Variations 8, 11, 13, 14, 17, 20, 23, 25, 26, 27 and 28 are specified for two manuals, while variations 5, 7 and 29 are specified as playable with either one or two. With greater difficulty, the work can nevertheless be played on a single-manual harpsichord or piano. After a statement of the aria at the beginning of the piece, there are thirty variations. The variations do not follow the melody of the aria, but rather use its bass line. The characteristic rhythm in the left hand is also found in Bach's Partita No. 3 for solo violin, in the A flat major prelude from the first book of The Well-Tempered Clavier, and in the D minor prelude of the second book. Heinz Niemüller also mentions the polonaise character of this variation. This is a simple three-part contrapuntal piece in 2/4 time, two voices engage in constant motivic interplay over an incessant bass line. Each section has an alternate ending to be played on the first and second repeat. Like the passepied, a Baroque dance movement, this variation is in 3/8 time with a preponderance of quaver rhythms. Bach uses close but not exact imitation: the musical pattern in one part reappears a bar later in another (sometimes inverted). 4 time. A rapid melodic line written predominantly in sixteenth notes is accompanied by another melody with longer note values, which features very wide leaps. The sixth variation is a canon at the second: the follower starts a major second higher than the leader. The piece is based on a descending scale and is in 3/8 time. Each section has an alternate ending to be played on the first and second repeat. The variation is in 6/8 meter, suggesting several possible Baroque dances. In 1974, when scholars discovered Bach's own copy of the first printing of the Goldberg Variations, they noted that over this variation Bach had added the heading al tempo di Giga. But the implications of this discovery for modern performance have turned out to be less clear than was at first assumed. This is another two-part hand-crossing variation, in 3/4 time. The French style of hand-crossing such as is found in the clavier works of Francois Couperin is employed, with both hands playing at the same part of the keyboard, one above the other. This is relatively easy to perform on a two-manual harpsichord, but quite difficult to do on a piano. This is a canon at the third, in 4/4 time. The supporting bass line is slightly more active than in the previous canons. This is a virtuosic two-part toccata in 12/16 time. Specified for two manuals, it is largely made up of various scale passages, arpeggios and trills, and features much hand-crossing of different kinds. This is a canon at the fourth in 3/4 time, of the inverted variety: the follower enters in the second bar in contrary motion to the leader. The follower appears inverted in the second bar. This variation is a slow, gentle and richly decorated sarabande in 3/4 time. Most of the melody is written out using thirty-second notes, and ornamented with a few appoggiaturas (more frequent in the second section) and a few mordents. Throughout the piece, the melody is in one voice, and in bars 16 and 24 an interesting effect is produced by the use of an additional voice. This is a rapid two-part hand-crossing toccata in 3/4 time, with many trills and other ornamentation. It is specified for two manuals and features large jumps between registers. Both features (ornaments and leaps in the melody) are apparent from the first bar: the piece begins with a transition from the G two octaves below middle C, with a lower mordent, to the G two octaves above it with a trill with initial turn. This is a canon at the fifth in 2/4 time. Like Variation 12, it is in contrary motion with the leader appearing inverted in the second bar. This is the first of the three variations in G minor, and its melancholic mood contrasts sharply with the playfulness of the previous variation. The set of variations can be seen as being divided into two halves, clearly marked by this grand French overture, commencing with a particularly emphatic opening and closing chords. It consists of a slow prelude with dotted rhythms with a following fugue-like contrapuntal section. This variation is another two-part virtuosic toccata. Specified for two manuals, the piece features hand-crossing. It is in 3/4 time and usually played at a moderately fast tempo. This is a canon at the sixth in 2/2 time. The canonic interplay in the upper voices features many suspensions. This variation is a virtuosic two-part toccata in 3/4 time. Specified for two manuals, it involves rapid hand-crossing. The piece consists mostly of variations on the texture introduced during its first eight bars, where one hand plays a string of eighth notes and the other accompanies by plucking sixteenth notes after each eighth note. The second of the three minor key variations, variation 21 has a tone that is somber or even tragic, which contrasts starkly with variation 20. The bass line here is one of the most eloquent found in the variations, to which Bach adds chromatic intervals that provide tonal shadings. This variation is a canon at the seventh in 4/4 time. This variation is a canon at the octave, in 9/8 time. The leader is answered both an octave below and an octave above; it is the only canon of the variations in which the leader alternates between voices in the middle of a section. Variation 25 is the third and last variation in G minor; a three-part piece, it is marked adagio in Bach's own copy and is in 3/4 time. The melody is written out predominantly in sixteenth and thirty-second notes, with many chromaticisms. This variation generally lasts longer than any other piece of the set. In sharp contrast with the introspective and passionate nature of the previous variation, this piece is another virtuosic two-part toccata, joyous and fast-paced. Underneath the rapid arabesques, this variation is basically a sarabande. Two time signatures are used, 18/16 for the incessant melody written in sixteenth notes and 3/4 for the accompaniment in quarter and eighth notes; during the last five bars, both hands play in 18/16. Variation 27 is the last canon of the piece, at the ninth and in 6/8 time. This is the only canon where two manuals are specified not due to hand-crossing difficulties, and the only pure canon of the work, because it does not have a bass line. This variation is a two-part toccata in 3/4 time that employs a great deal of hand crossing. Trills are written out using thirty-second notes and are present in most of the bars. The piece begins with a pattern in which each hand successively picks out a melodic line while also playing trills..
"As soon as they were assembled a chorale was first struck up. From this devout beginning they proceeded to jokes which were frequently in strong contrast. That is, they then sang popular songs partly of comic and also partly of indecent content, all mixed together on the spur of the moment. ... This kind of improvised harmonizing they called a Quodlibet, and not only could laugh over it quite whole-heartedly themselves, but also aroused just as hearty and irresistible laughter in all who heard them." A note for note repeat of the aria at the beginning.